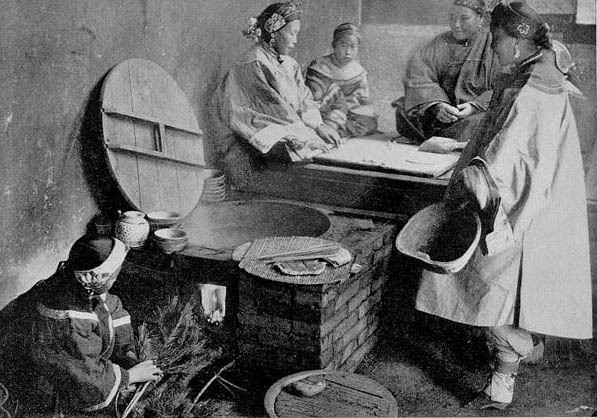 Chinese women's clothing naturally varied by class, season, and region of the country, much as men's did, but dresses, skirts, jackets, trousers, and leggings were all common types of garments. What features of the dress of these two women give an indication of their class? 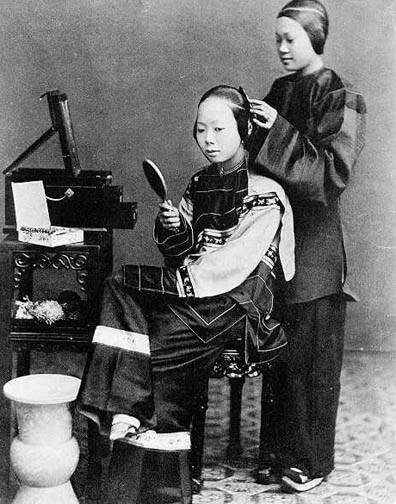 A large proportion of Chinese women in the late nineteenth century had their feet bound small while they were children. 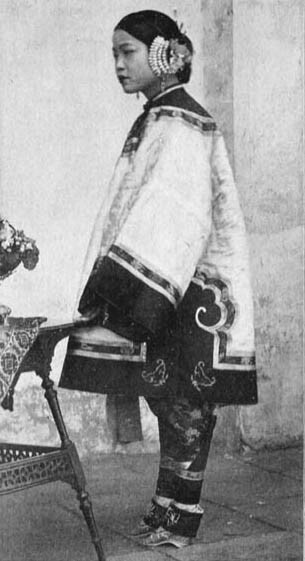 The woman seen in this late nineteenth century photograph was an entertainer, a sing-song girl, but footbinding was also practiced by the families of scholars and merchants. 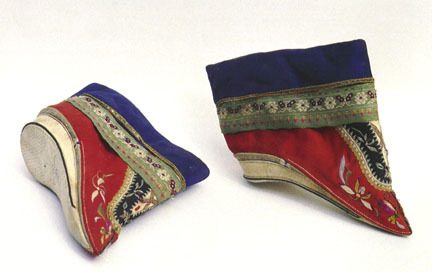 The shoes that covered bound feet, as well as the leggings over the top of them, were often elaborately embroidered, as seen in these examples. 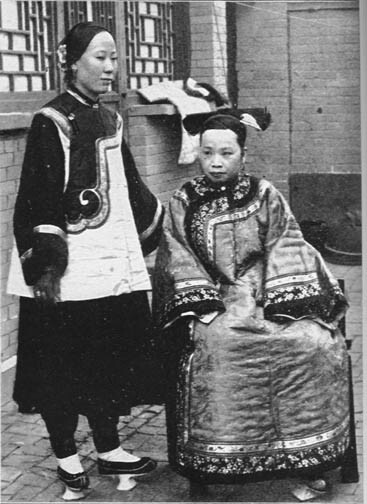 Westerners often commented that, as you can see in the photograph below, Chinese women's clothes did not reveal the shape of their bodies in the way Western women's clothes of the period did. 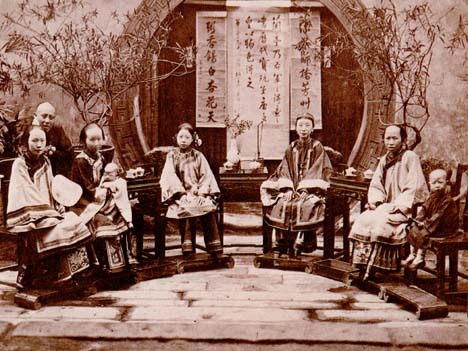 Can you think of any reasons Chinese may have preferred loose clothing? 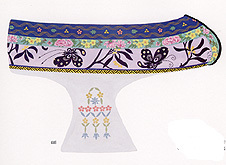 Notice the use of embroidery to decorate these women's clothes. 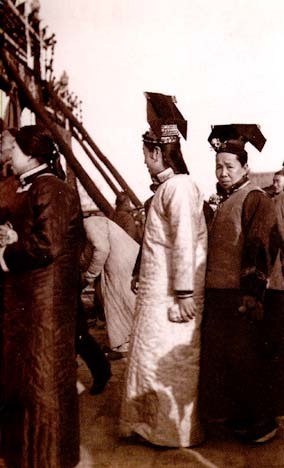 To see photos of clothing like these women are wearing, click here. 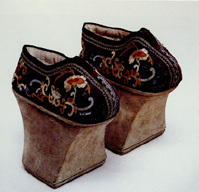 Manchu women did not bind their feet, but wore elevated shoes that created some of the visual effects of bound feet. 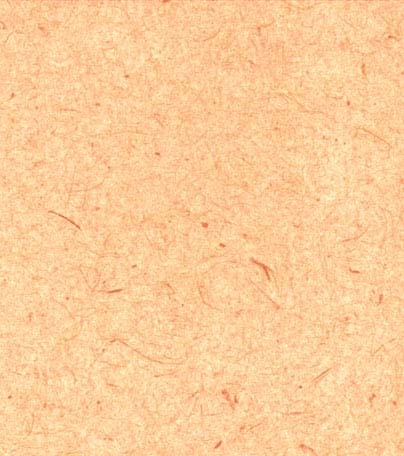 What features of their appearance would you think might signify the social standing of these women?